American manned spaceplane. Study 2004. X-Prize suborbital spaceplane concept of Pioneer Rocketplane, Solvang, California. No backing forthcoming. Status: Study 2004. Payload: 400 kg (880 lb). Thrust: 88.94 kN (19,995 lbf). Gross mass: 8,200 kg (18,000 lb). Unfuelled mass: 3,200 kg (7,000 lb). Height: 13.10 m (42.90 ft). Diameter: 1.52 m (4.98 ft). The engine rocket engine was a pressure-fed, vortex cold-wall-based system developed by Orbital Technologies Corporation (ORBITEC). This engine could provide the needed performance at a low cost, with high reliability and long life. 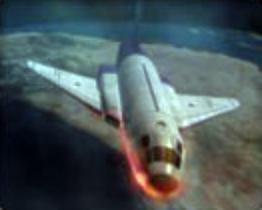 By 2004 Rocketplane Limited had reached the full design phase. Rocketplane's propulsion team member, ORBITEC, had conducted tested of prototype rocket engines of many sizes, including a static firing of the RP-1/LOX cold-wall vortex engine. The flight sequence would involve: takeoff at jet engines, and ignition of rocket engine while cruising horizontally at 9 km altitude; maximum G-force during the 120 second engine burn of 2 g's; engine cut-off at 53 km altitude and 3200 kph; ballistic arc to 107 km with four minutes of weightlessness; orientation in space using cold gas reaction control jets; re-entry deceleration of 3 to 4 g's; pullout to horizontal glide and restart of jet engines; powered, horizontal landing at landing strip from which flight originated; one hour total duration of mission; turnaround time between missions: 3 to 5 days . Family: America's Space Prize, Spaceplane, Suborbital. Country: USA. Propellants: Lox/Kerosene. Agency: Pioneer Rocketplane.